My family entered plastics distribution and fabrication in 1968. Dad listened to the guy in "The Graduate" and bought in. I was a teen with access to a shop filled with Plexiglas® Acrylic sheets, Lexan®, Plastic Sheets & Fiberglass sheet. Add UHMW, PTFE, plastic glue, Multiwall polycarbonate, Seaboard, architectural and engineering plastics. 40 years later I educate our team on new materials and processes - to customers worldwide. It’s new every day. 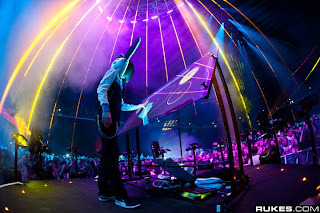 Special EliT Plexiglas® acrylic sheet helps my man Deadmau5 manipulate holographic images in London. As I understand it, the production company sourced the technology from one of my customers who worked with us to get the podium Plexiglas® just right. The effect is like the "Minority Report" graphics on hallucinogens. Cheers to everyone. Can't wait to see the mau5 next time he's in San DIego. Copyright 2011 - All Rights Reserved. Powered by Blogger.